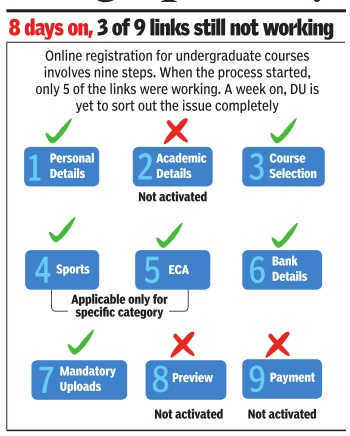 The hurdle of filling the DU Online Application Form is still there as the Login Panel for filling the application form is not fully functional. It has been almost a week since the online application form of DU started and not even a single form has been completely filled by the students. The three out of the nine tabs are still not working which includes the major tab academic details. The students are getting annoyed and feeling helpless as the Delhi University has not been able to solve the issues for submitting the application form. As per the DU officials, the academic tab was expected to be active from Tuesday after the declaration of CBSE 12th Result but it is still not working yet. It seems the students have to wait a little more to get admission in Delhi University. Register for Free DU Admission SMS Alert and we will send you SMS for all the latest updates on DU Admission 2017. The Delhi University introduced the online application process in the year 2012 and this is the first year when the students are facing such kind of problem. As a result of this, a lot of students are attending the open house in large numbers. Now the open house venue is eventually loaded with students and parents with a lot of queries. Open Days are conducted by the University of Delhi every year to counsel and guide the admission seekers and their parents. Due to the delay in activating the Application Tabs in DU Form, the application process of some minority colleges like St. Stephen’s and Jesus and Marry has also ben delayed as the students need to submit the registration number of DU which gets generated after the completion of application form. Amidst the mayhem of the Delhi University admission process, the university has decided to delay the registration of postgraduate courses also by another week. Therefore, as per the revised schedule, the online registration will now start from 7 June 2017 which was earlier starting from 31 May 2017. The DU Officials have accused the moderation policy of the delay of opening the academic tab. The DU officials said that - The moderation policy is still in court and sub judice. Therefore, we want to tread carefully in the matter of marks. The moderation policy is basically a provision of providing grace marks to students who are falling short of a few marks from passing the board exam. It also makes provision for giving grace marks to students for extra difficult questions in the question paper or for any question with errors. 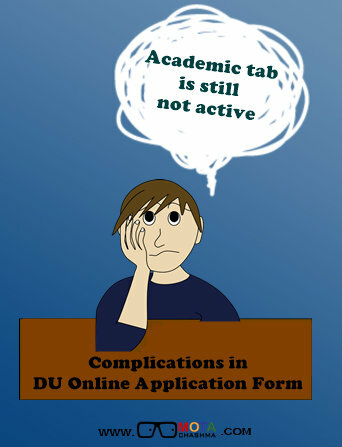 In the DU online application form, the three out of nine tabs are not working from which academic details tab is major. The DU officials condemned the moderation policy for delaying to start the academic tab. This is the first time the students are facing such kind of difficulty since the online application form of Delhi University started. The anxious and annoyed students and parents asked all their questions to the available officials and teachers in open day. There is no official indication or reports about activation of the inactive tabs. Amidst of all these, the university has decided to delay the registration of postgraduate courses also by another week. DU Admission 2017 Schedule Announced!